Geem Jasaiin is an Argonian commoner residing in the Imperial City's Elven Gardens District. He spends all of his waking hours enjoying the benefits of the big city, while hanging out with his two best friends, Wumeek and Dul gro-Shug. He also pays monthly visits to a good friend in Chorrol. He claims to have left the Black Marsh to take advantage of his inborn abilities and make some gold working the Imperial City's Waterways. However, he must be between jobs as he is never even seen near the water. Instead, he gets out of bed every day at 5pm and meets up with his two friends at the neighboring King and Queen Tavern for an evening of drinking and exchanging anecdotes, only interrupted by a two-hour meal back at his house at 6pm. At 11pm, the trio leaves the tavern and staggers back to their respective homes for some much needed sleep. On Tirdas and Turdas, when the clock strikes 11am, Geem will pay a visit to Wumeek until 4pm. At all other times, he will be fast asleep in his bed, sometimes for a whopping sixteen hours in a row. On the 9th of each month, when the clock strikes midnight, Geem gets out of bed and starts his long journey towards Chorrol. He crosses the Talos Bridge and heads northwest on the Black Road, passing through both Fort Ash and Weynon Priory. After eight hours of walking, he usually enters Chorrol through the southern gate at 8am. Once there, he books himself some shelter at The Grey Mare. At 10am, he heads for the Chorrol chapter of the Mages Guild to pay a visit to his Argonian friend Teekeeus. He will hang out in the Guild Hall all day until 8pm, when he heads back to the inn. On the 10th, he will pay Teekeus a similar visit before he heads back to the Imperial City at midnight on the 11th. He wears a set of middle class class clothing: a red burgundy linen shirt, tan linens, and russet felt shoes. He carries around his house key and a small amount of gold. When you meet him for the first time, he will introduce himself and reveal his reason for moving to the big city: "I am Geem Jasaiin. We come from Black Marsh to the city to work the water ways and water trades." 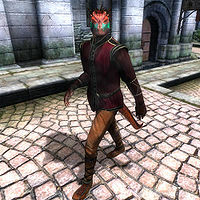 He will also provide you with a bit of insight upon the differences between the Black Marsh and the Imperial City: "To earn gold, Argonians must come to the city. It is a strange life, shaped stones and whiteskins everywhere. But in the water, we are the masters, and whiteskins pay well for our skills." Because the game engine calculates traveling times a bit differently, the above traveling times doesn't always hold true. As a result, if you wait for Geem in Chorrol, he will arrive at 4am. If you wait for him back in the Imperial City, he will return at 4am. Both times are approximate. His sleep package has no duration, meaning he sleeps until it is time for his appointments rather than wandering around his house as most homeowners do. Esta página foi modificada pela última vez à(s) 05h27min de 20 de outubro de 2015.